I think I may have found my new favorite sweet pepper. Too bad it's a hybrid! I bought a packet of Lunchbox peppers from Johnny's this spring on a whim. We've been pretty happy growing pimento-type peppers since the smaller fruits ripen up before frost even if I don't start the plants inside ultra-early. But my heirloom variety started to decline in vigor after a few years, perhaps because I didn't grow enough plants to keep the gene bank deep. Anyway, to cut a long story short, I chose two new varieties this spring, selecting from among peppers with the fastest days-to-maturity. The pimento-type pepper (Round of Hungary) that I tried this time around did ripen its first fruit just as quickly as the Lunchbox peppers, but the former has been providing approximiately one red pepper per week from three plants while the latter is overflowing with goodness from a similar size planting. Even after adding peppers to our salad all week, I still ended up with a bowful in need of preservation. Lunchbox isn't really a variety but a mix of three different types of pepper. Luckily for me, most of my plants turned out to be the red type, since that one is much more vigorous than the yellow and orange. 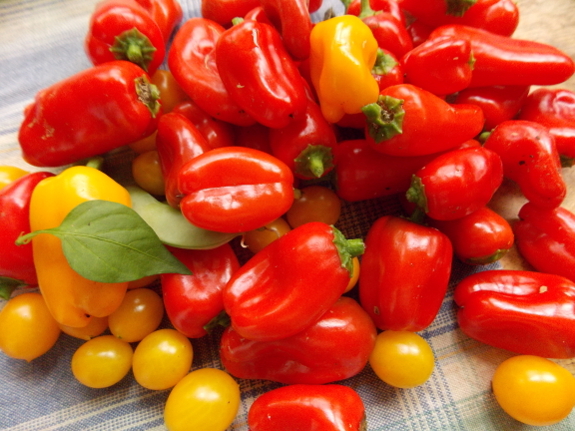 The plants and fruits look like hot peppers, but the peppers are sweet and delicious (although with slightly thinner flesh than you'd expect in larger peppers). 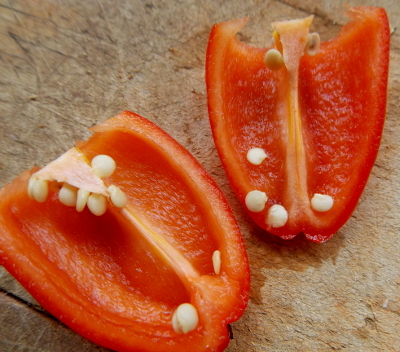 I wonder what I'd get if I saved the seeds of my Lunchbox peppers and tried the hybrid offspring in next year's garden? Those peppers look delicious. I grew too many hot peppers this year and I am wishing I had more sweets. I will certainly consider growing some lunchbox peppers next year. Thanks for sharing. I have been growing them for years. My wife and I stuff them with various standard things you stuff peppers with. We have found that they do not reproduce as well the next year on saved seeds (about 1/2 the yield - just a guess). Since I buy seeds most years anyway, I just make sure that is one of the ones I get if I am running out of the original seed packet. I typically do 6-9 plants a year. They are a bit hit with the neighbors as well. I've been growing open pollinated Chocolate peppers for years, but I usually buy the seeds from one year to the next. This year I planted California Bells and expected to get a good crop well before the end of October, but this year I ended up with some kind of worm eating them before they got red on the outside. (grrrr...) I love my sweet peppers because I roast them, remove the blackened skin and keep them in the freezer for putting on top of portabello mushrooms when I grill those like a mini pizza. Also, I used to make Armenian Pepper Paste (APP), which should, technically, be made with hot peppers but I'm only now getting into "spicy" food. Then I take the APP and fry up some green beans using the APP as the "sauce" and oh my! is that delicious. Haven't tried saving seeds from one year to the next, but intend to do it this year to see what happens. I also planted some Cajun Beauties in a pot which I will pull into the house when it gets cold so I can have some peppers over the winter. My living room looks like a greenhouse! My views on saving hybrid seeds are that it is a fun experiment. You might get the vigorous parent or you might get the delicious parent. Or you might get lucky and get the same as you saved from. To me it is worthwhile to try. I would also pot up the plant and bring it inside for the winter. It might work better than the tomato did this year.